Take Wing Takes You There! Powerful solutions to live your best life. By empowering women of all ages to live their best life, to be happy, centered and fulfilled, we can then reach beyond ourselves to making a difference in the world. We want more women in powerful positions contributing in the spirit of cooperation, not competition, through inclusive, not exclusive systems. Life Mastery Courses, Self Care Products, Self Discovery Services, Community Forum. Take Wing offers soul-utions for your journey into Self Knowledge, Personal Development and Growth. Open, unlock, release the potential and possibilities of your life. Reveal that which has held you back from living into your highest and best life today and every day. Don't go it alone. Take Wing takes you there! Take Wing offers women a Safety Nest for Self-discovery where we learn how to integrate Body+Mind+Spirit, aligning ourselves with our core values for true fulfillment. We are here to help you figure out exactly what those values are and create a plan for staying in your personal power, finding center, making personally powerful and balanced choices. Take Wing offers women a Community of Courage where we share our knowledge and growth through the ancient tribe of The Feminine, and apply what we learn to our lives and relationships. Take Wing offers women a chance to Soar into New Chapters in their lives where we learn to expand the vision of Self to include limitless possibilities in a loving and supportive Universe. DESIRE without the freedom to express it and the skill set to fulfill it, can be a frustrating companion. Simple ignorance of this fact can hold you back from living the life of your dreams. And you have these dreams for a REASON. Your soul is showing you your Tao, the way, your path to follow. Emotions are your compass and guide you on this path. When our thoughts, desires, emotions and actions are in alignment, then we find our true north and are forever guided from a place of inner strength and knowing. We walk together on this journey, supporting, uplifting, and holding each other gently accountable, for life is a PROCESS and we are all in this together, and together we will manifest success. 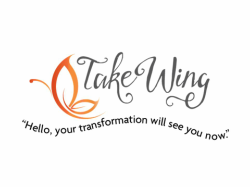 Take Wing seeks to provide you with gifts and guidance, experts and experience, tools, stories and examples, oh, and hopefully some FUN along the way! Take Wing is a community for women, a consortium of experts offering a kingdom of magic keys any of which may unlock the door to your dream life, or at least throw open some windows for fresh air! The good news is YOU are the key. You are the Hero in your life. We're here to help you unleash, unveil, uncover your inner hero who then creates the life of your dreams. Take Wing Now Ltd. is a Limited Liability Company legally formed on June 10, 2016, yet dreamed into existence long before. Take Wing's creator, Colleen Dunn Saftler, visualizes the ultimate goal of all endeavors as World Peace. The natural balance of male and female energies have been askew amidst a prevalence of patriarchal societies for millennia. We empower women to take full responsibility for their lives, their mental and emotional states, and give them the tools to create a life based on Self Acceptance, Self Love and Personal Power, Take Wing seeks to contribute to the creation of a more balanced planet, one where cooperation rather than competition prevails for all of living kind. Her-story is in the making. Take Wing Now Ltd. is a Limited Liability Company legally formed on June 10, 2016 for the betterment of all living kind. More to come!